I wonder how many of you have been to the Kemah Boardwalk in the last 20 years. If you have not, you may wonder what I am talking about in the preceeding captions. 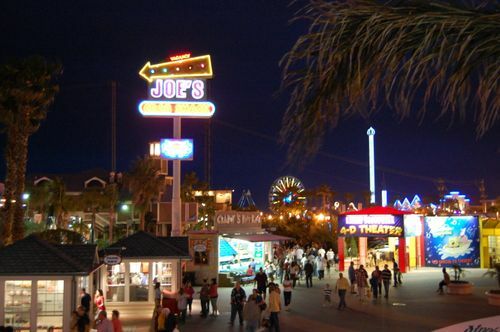 What you may remember is the Kemah strip as we knew it in high school. Jimmy Walker's Edgewater Restaurant was at the end, located right up next to the water of the bay. Many of us ate occasional meals there with our families or on special dates. There was also the Clear Creek Inn about midway down the 2 block strip - good, fresh seafood served in a more homey environment. Several times a year my family met relatives at the latter establishment for a delicious seafood dinner. Other than those two eating establishments, there were various boatyards and excursion boat docks along the strip. One of those boatyards belonged to Ed's dad. His family lived in an apartment over the storerooms and offices of the Davis Boatyard. Ed worked there alongside his dad, using a crane on the premises to hoist the fancy vessels out of the water for repairs. The significance of this picture is that Joe's Crab Shack is now located on the site of that boatyard. So when we walk through that area, enjoying the many diversions provided by vendors and restaurants and street performers, Ed remembers the sights and sounds and smells of his childhood. And togther we remember one of the first times we met as Randy took our family across the street after a meal at the Clear Creek Inn to meet a guy that lived down the hall from him at Baylor.